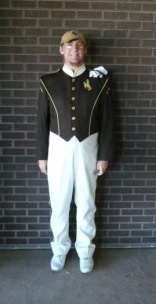 Sara was a member of the University of Wyoming Marching Band from 1989-1993, and in 1996. During her five seasons in the marching band, Sara played clarinet, cymbals, and sousaphone. She also played clarinet and sousaphone in concert and pep bands. Sara was an active member of Tau Beta Sigma. She graduated with degrees from UW in International Studies in 1993 and Economics in 1996. She also earned a Master’s in Economics from the University of New Mexico in 2000. Sara returned to UW in January 2013, this time to earn a degree in Secondary Math Education. In the fall of 2012, a new generation of Saulcy's came to the Western Thunder Marching Band, when Sara’s daughter, Ashley, joined to play in the piccolo section. Lori was a member of Western Thunder from 1992-1995 during her time with Western Thunder Lori was in the Color-guard, serving as Tri-Captain in 1995. Lori Graduated from UW with a degree in Professional Child Development in 1998 and now works for UW in the Department of Mathematics & Statistics. In the fall of 2015 the next generation of Dockter's joined Western Thunder when her daughter, Lexi, joined the color-guard. Mary Ann Thompson~ Attended UWYO from 1973-1978, graduating in 1977 with a B. A. in History. Marched in the band all five years, which included going to the Fiesta Bowl in 1976, playing the alto sax. After grad school in Kansas (M. A. in History) and in Denver ( MLS in Library Science) moved to Hays, Kansas working as a librarian at the public library, running the local history special collection. Retired in 2012. Claim to fame: have attended Homecoming and been in the Alumni Band every year since 1980.